Oh Florence, how I love you so. As a wedding photographer, when I get an enquiry for a wedding in Florence, I can't help but feel a little bit of excitement. Simply, Florence is beautiful. It's colourful and romantic, old-fashioned and modern, hectic and relaxing. I love it. Arguably the last preserved Renaissance city in the world and birthplace to many notable historical figures, Florence (Firenze to the Italians) brings forth this rich history perfectly to make it the modern city that it is today. Widely regarded as one of the most beautiful cities in the world, your wedding guests would undoubtedly jump at the opportunity to visit Florence. 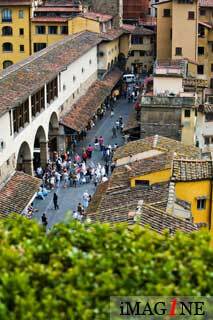 Amongst the many elegant 'piazze' (squares), Renaissance palaces, gardens and museums you'll discover the famous Ponte Vecchio, the Basilica di Santa Maria del Fiore (Florence Cathedral), Michelangelo's Statue of David and the Uffizzi Gallery. The Sala Rossa (The Red Room) is situated in the Palazzo Vecchio (Old Palace) which is in the Piazza della Signoria - on the corner with The Uffizzi Gallery and the Loggia dei Lanzi. You enter at the door where the replica Statue of David is positioned. The courtyard and stairs leading up to the Sala Rossa are quite unassuming which makes the entrance into the Sala Rossa even more memorable. I love to stand just inside the doorway and capture guests' reactions to seeing the Sala rossa for the first time. Jaw-dropping is the word! The image opposite was taken at a wedding that I photographed in Florence in 2009 - Dave & Kate married in Florence's Sala Rossa. In November 2010, I was the wedding photographer for Yin & Ade's beautiful wedding. 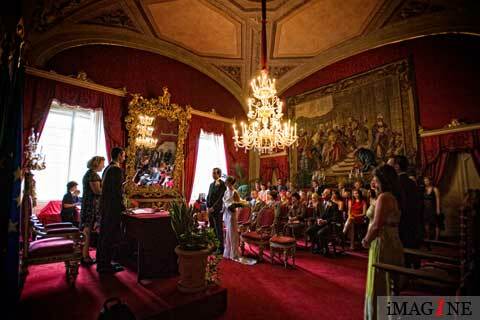 They exchanged vows in the Sala Rossa and walked through Florence, with their guests in tow, to the Grand Hotel Baglioni. 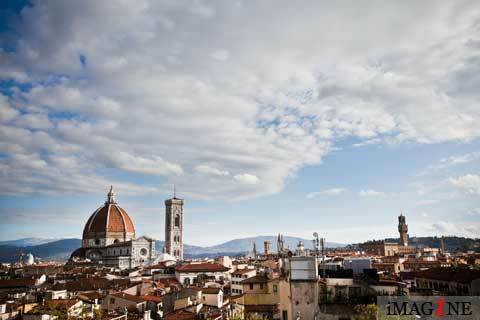 The image at the top of the page was taken from the roof terrace of the Grand Hotel Baglioni. Don't discount winter weddings here either. Check out the weather! The image to the left was taken as they meandered through Florence town centre, by-passing the famous carousel in Piazza degli Strozzi, and on to the Grand Hotel Baglioni. 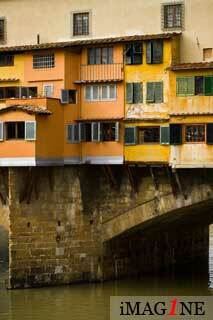 The Old Bridge, the Ponte Vecchio, is a medieval bridge over the river Arno in central Florence. One of Florence's most famous landmarks due its colourful and interesting architecture and the little jewellers' boutiques, that literally cling to the bridge itself. It is believed to have been built in Roman times. The images here show the Ponte Vecchio from two very different angles, the first image is looking down on to the bridge - a really unusual angle and one that few get to see. Florence's Hotel Continentale is where this image from taken from when I was the wedding photographer for Dave & Kate who held their reception at this modern hotel's Skybar. Between their ceremony in the Sala Rossa and their evening bash at the Skybar, Dave, Kate and their wedding guests had their wedding breakfast at the hip Borgo San Jacapo Restaurant. A really trendy spot on the far side of the river which has an amazing view of the Ponte Vecchio and along the Arno as the restaurant's balcony 'hangs' over the river. 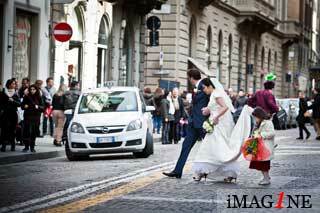 Another great spot for a wedding in Florence and certainly worth consideration. Castello di Vincigliata is one of my favourite venues on the outskirts of Florence, in a town called Fiesole. Fiesole is higher than Florence and the views of the city from Fiesole are wonderful. I have been the wedding photographer at Castello di Vincigliata on several occasions; the choice of ceremony venues nearby are many. Fiesole Cathdral, just a few kilometres from the Castle is a great option but you could also choose to start the day in central Florence and marry in one of the city's churches such as Chiesa dei Santa Michele e Gaetano. 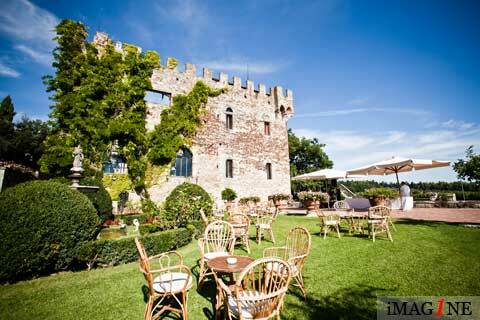 Castello di Vincigliata: a brilliant choice for a wedding in Florence. In my galleries, see if you can spot an image of guests seated for their meal in the courtyard, you'll love it. If you're looking more generally at weddings in Italy and have yet to make up your mind where your wedding will be, perhaps you'd like to try my wedding photographer's guide to the Italian Lakes.